Alevo's manufacturing equipment will be used in a new battery gigafactory planned for New York state. IM3NY was expecting the deal to complete late this month after placing a $1 million deposit. Meanwhile, Magnis, which is listed on the Australian Securities Exchange, was planning to pay for its share of the purchase and at the same time increase its 30 percent stake in IM3NY with a AUD $5 million (USD $3.9 million) share placement. Magnis' share in the partnership, which was unveiled last October with names including C4V, C&D Assembly, Primet Precision Materials and Kodak, “will be disclosed on the closing of the purchase,” said the Australian firm in a press release. Under the deal, IM3NY is pursuing speed instead of scale. IM3NY, which secured $13.25 million in state funding announced by New York Governor Andrew Cuomo last October, was originally planning to open a $130 million, 3-gigawatt-hour-a-year factory in the second half of 2019. The Alevo equipment acquisition means the factory will now have only a third of that capacity. But it will have cost less than 4 percent of the original amount budgeted, not including removal, re-engineering and reassembly costs, with production expected to start within 12 to 15 months, Magnis said. The assets snapped up by the consortium include machinery for slurry making, coating, cell assembly, formation and testing, and module assembly and packing. IM3NY intends to remove the equipment from Alevo’s leased factory building in Charlotte and relocate it to Huron Campus, in Endicott, New York, which was formerly home to IBM and has now been earmarked to deliver up to 15 gigawatt-hours of battery manufacturing capacity a year. The plant will be re-engineered to incorporate materials and processing technologies from the IM3NY consortium, as well as introducing equipment for cylindrical battery production in addition to existing prismatic cell machinery. 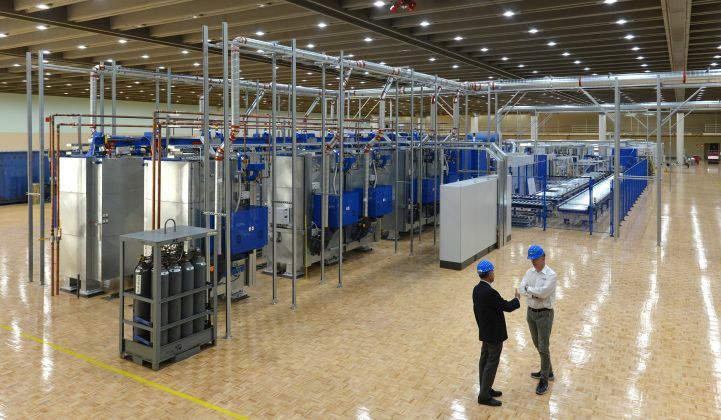 Peter Heintzelman, Alevo’s interim group CEO, did not comment on the sale of the factory equipment but told GTM that the company’s remaining assets were still for sale. These include the intellectual property for Alevo’s nonflammable 50,000-cycle battery technology, an electrolyte plant in Martigny, Switzerland, and a single GridBank lithium-ion storage system operating in the PJM Interconnection ancillary services market. Alevo filed for Chapter 11 bankruptcy protection last August but has remained operational while administrators looked for takers for the business. The company’s assets were split between a Swiss parent group and the U.S. factory. IM3NY’s purchase of the factory equipment means there is no chance of the entire business being sold, which likely spells the end of the Alevo brand. It is a shot in the arm for Magnis, though, which has already secured a supply agreement with Celgard, a lithium-ion battery separator technology provider. The agreement is aimed at IM3NY’s operations in New York and the two other gigafactories that Magnis is developing. One is a 15-gigawatt-hour-a-year facility planned for Woodstock, near Townsville in Queensland, Australia, which is slated to enter production in 2020. The AUD $2 billion (USD $1.6 billion) project has already been given AUD $3.1 million (USD $2.4 million) of state money for a feasibility study, the Australian financial press reported last November. Magnis’ other gigafactory is a joint venture with a public-private partnership including BP, the oil and gas major, which could see 30 gigawatt-hours of batteries being produced annually at a site in North Rhine-Westphalia, Germany.